Luxury meets technology at the four diamond, AAA-rated Red Rock Resort in Las Vegas, which recently replaced an aging projector system with three NanoLumens 2.5MM NanoSlim Engage LED visual solutions, covering 1,730 square feet in its Race & Sports Book. Red Rock Resort is the only Las Vegas-based casino named on USA Today's Top 10 Casinos list. The new solutions, as well as three new 12-inch-tall scrolling screens as footers, are the largest ones of their kind ever installed in North America, according to Nanolumens. The NanoSlim Engage solutions allow 4K video content to be viewed in Ultra High Definition. The new digital canvases, installed by Las Vegas-based National Technology Associates, replaced a total of 18 video projectors — six per screen — that were costly to operate and maintain, while requiring regular adjustment to the software. Now, three new NanoLumens 2.5MM NanoSlim Engage solutions offer brighter pictures at lower operating costs, reducing the Race & Sports Book's HVAC energy costs. In addition, each visualization solution had to fit exactly into the existing openings where the previous projector-based systems had been; the modular nature of the NanoLumens technology allowed for exactly that. "These screens are literally running at just 10 percent of their potential brightness, and are already dramatically brighter than the projection video system they're replacing," said H. Waldman, chief operating officer at NTA. The screens, each measuring 31.5-feet-wide-by-17-feet-tall and totaling more than 1,700 square feet of video surface with a native resolution of 3840x2112, were installed in the openings previously occupied by the projection systems. 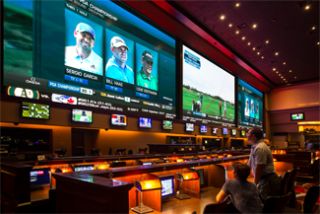 They were installed one at a time, with two screens able to remain on at any time, allowing the sports book to operate without interruption. "It took about a week to install each solution, which is very fast considering there were a lot of connections to be made with the new head-end AV system we also installed," said Waldman. "The NanoLumens Nixels were extremely easy to work with." At the beginning of the development process, Red Rock Resort's management and NTA consulted with NanoLumens about what would be possible for its race and sports book experience to continue to be among the best in the industry. "They wanted this to be as cutting-edge as possible," said Doug Fundator, vice president of gaming/casinos at NanoLumens. "Station Casinos' Race & Sports Book executives wanted the sports book's AV to be superior with the benefits that LED technology brings with it. NanoLumens was able to provide exactly that. Working closely with the customer and the integrator, we were able to make sure everyone's expectations were met." As a result, the newly renovated Race & Sports Book is "a game changer" for the hospitality industry, Fundator added. Art Manteris, vice president of Race & Sports Book Operations for Station Casinos agreed. "The new NanoLumens visualization solutions look fantastic — there's no separation between Nixels," said Manteris. "Now, when you're watching HD you are not limited by the display, only by the source. This is the kind of investment that will continue to set Red Rock Resort apart."